← Wader Frater Proves He’s No Saint! Discussing everything from playing in York City’s famous 3-0 triumph over Manchester United, to scoring his first goals for Sunderland, his respect for the hardworking professionals of the Northern Premier League and much more, Darren talks me through his fascinating journey, with honesty and heart. DB: Hi Darren. You grew up in Middlesbrough during the ’80s, which was a difficult period throughout the North East with the pit closures & unemployment. What was life like as a kid in ‘Boro at that time? DW: I think it was difficult for the town at that time, and that was reflected in Middlesbrough F.C.. For the club, it was more a case of survival than anything else. From a financial point of view, obviously clubs like that have academies now, but the youth policy at Boro then was very different. As young footballers, we were training in a gymnasium – about 30 or 40 kids at a time. It resulted in too many players with ability being overlooked. DB: You joined York City’s youth setup in 1993 and made your debut for the club in December 1994 after superb performances for City’s ‘intermediate’ side. What do you remember about your early time at Bootham Crescent and making your professional debut in a 4-0 win over Blackpool? DW: I joined as a YTS, and had to do everything from cleaning the stands to scrubbing hallways and toilets. It was a proper YTS experience, and a lot of the players who went through that came out the other end as better people. I still think young players should have those duties; I never saw a reason why it should have changed. Leading up to my first-team debut, I played for the youth team in the morning and then dashed back to the ground to be on the bench against Blackpool, and I came on as a sub. I played two games in one day, but thankfully we were at home, so I didn’t have to travel too far! DB: On 20th September 1995, you played in arguably York City’s most famous victory of all time. The Minstermen won 3-0 away at Manchester United (City eventually went through 4-3 on aggregate). 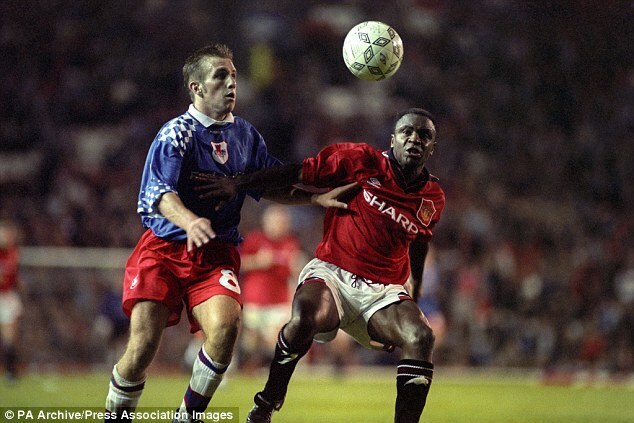 Were you confident before the first-leg that you could overcome a footballing power like United? And what was the atmosphere like at Bootham Crescent for the return? DW: No, we weren’t confident going there that we could beat Man United. At that time, they had some fantastic players and a massive squad. We just went to enjoy the occasion. Most of the lads hadn’t played at Old Trafford before, and it was a big occasion for us. York had a great support at the time who travelled down to Manchester, and we played really well for them on the night and managed to come away with a 3-0 victory. Bootham Crescent was packed to the rafters for the second-leg, and Man United had included some of their top players. Fortunately, we got a goal just before half-time and it was enough to take us through. Williams gets to grips with the Man United attack, in their 3-0 win over the footballing giants. DB: Despite that famous cup win and York City narrowly avoiding the drop to Division Three, you left to join Sunderland in Summer 1996. Why did you decide to leave Bootham Crescent? And did you get other offers as well as Sunderland’s? DW: Yeah, there were a couple of offers. However, my Youth Team manager at York, Ricky Sbragia had gone to Sunderland, and he recommended me to Peter Reid. At the time, it was an offer to jump from Division Three to the Premiership, so from a career point of view it was a no-brainer really. DB: Did you find the transition of moving up to a bigger club like Sunderland quite easy, or was it a difficult one? DW: I think I adapted quite quickly to be fair. I didn’t expect myself to, I thought it would take quite a bit of time to settle in there and to appear in the first team. I didn’t have to wait too long to play, actually, and the whole transition was quite smooth. DB: In your first season at Sunderland, the club were sadly relegated from the Premier League. However, on a personal note, you scored your first professional goal in a 1-1 draw with Leicester and scored the winner away at your hometown club Middlesbrough. Tell me about those moments. DW: The one at Leicester came out of the blue! Martin Smith got to the byline, pulled the ball back and fortunately enough I arrived at the right time to volley it into the bottom corner. Being my first goal, in the Premiership, was special. I wasn’t a natural goalscorer, I’ve always been more of a defensive player, but at Sunderland they played me in a slightly more advanced position [than York had], so it allowed me to get forward a bit more. The goal against Boro was vital at the time, as we were scrapping for points – and the fact they were my hometown club made it extra special. The funny thing is that I was supposed to be marking Juninho, but I ended up with a free role in the first-half because they’d left him on the bench! 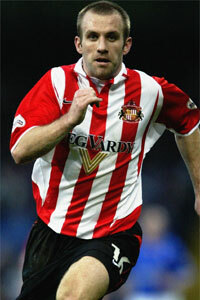 In full flow: Williams on the move for Sunderland, his club from 1996-2004. DB: In 1999, Sunderland won the old Division One to return to the Premier League. The year before you’d played in that incredible, heartbreaking play-off final where Charlton won on penalties after a 4-4 draw. Do you think the hurt of losing that final spurred yourself and the whole squad on for the following season? DW: I don’t think it was the hurt of losing that season. It was the experience of that [1997-98] season, where we should have gone up automatically. There was one night at the Stadium of Light where we were 2-0 up against QPR, and ended up drawing 2-2, which effectively knocked us out of second place. We learnt from that experience, and took that whole season on board. In the following campaign we pushed on and dominated the league from start to finish. DB: You left Sunderland in 2004, but after a brief stint at Cardiff City, you headed back North to Hartlepool United. In your second season, the club were promoted to League One with Danny Wilson in charge. Danny’s perceived as a tough, no-nonsense manager. How did you find playing for him? DW: I got on okay with Danny. We fell out on the odd occasion, but I found Danny to be a nice bloke and a decent manager, to be fair. We didn’t argue over anything personal, it was just football-related stuff, and we always got on fine again after any disagreement. That’s how it is in football, you have your run-ins and then once the matter’s done and dusted, it’s forgotten about. You’re always likely to clash at some point in your career, with somebody – and unfortunately I’ve experienced that on a couple of occasions myself! DB: Shortly before making the transition into playing Non-League football, you joined Dundee, pairing up with your old Sunderland teammate Alex Rae, who was then player-manager at Dens Park. Did you enjoy your experience of Scottish football? And was it tough to have a manager who you’d previously played with instead of for? DW: No, it wasn’t tough to have a manager that I’d previously played with, because I respected Alex and we’d got on really well when we were at Sunderland. He called me and asked me to go up and play at Dens Park, and it was a decision I wasn’t too sure about – but I went up there. I enjoyed the football side of things, but not life there. No disrespect, but Dundee isn’t the greatest of places and that area is quite remote. That was hard, and unfortunately Alex got the sack shortly after, and another guy I’d worked with, Jocky Scott took over. I got on okay with Jocky, but I’d moved up there to play for Alex, really. DB: You joined Gateshead, in the Conference Premier in 2009. I believe that deal took a while to happen, because you were still hoping for a professional club to come in. So was it tough to accept that you were playing at a lower level than you had been earlier in your career? DW: It wasn’t tough to accept, but I was looking around for a while, hoping that I’d get an offer from a League club. Obviously though, the longer you wait the harder it gets to find a club. Joining Gateshead was a decision I should have made a little bit earlier. I enjoyed playing for them, and being at a local club, but I just didn’t see eye-to-eye with Ian Bogie, the manager. I was a senior pro and I had a view of how things should be done, and I thought some of the decisions he made were just not right. DB: Whitby Town, where you arrived in 2011, was your first foray into management; as player manager. You’ve done a superb job, establishing a pretty small club as Northern Premier League mainstays. How would you describe your man-management style and the way you want your teams to play? DW: We’re an attractive footballing side and we have players with good footballing pedigree. That’s how I’ve always wanted us to play. In terms of man-management, dealing with players is something I think I do really well. I’ve had positive feedback from players I’ve previously coached, as well. Dealing with individuals is all part-and-parcel of management and I consider it one of my strengths. DB: At Whitby Town, you have players in your squad like Lee Bullock – who you played with at Hartlepool – and Mark Robinson – who you played with at Gateshead and Gainsborough Trinity. Why do you think it’s so important to have former teammates at the club with you? DW: It’s good to have people you know around you, because that mutual respect is already there. You know their character, and that they are honest lads. If they have a problem, or you make decisions that they don’t agree with, then those guys will come out and say so. What I wouldn’t like are players who didn’t agree with something I did, and then talked behind my back about it. 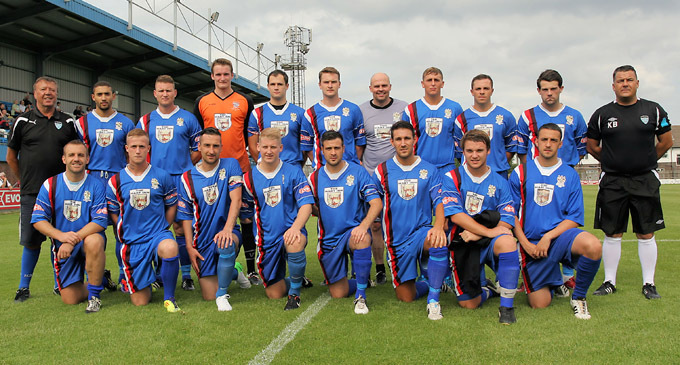 Darren (far left, front row) and his Whitby Town charges, in 2012. DB: In Non-League, players and managers move between clubs a lot, more frequently than in the higher echelons of the game. What is it that you’ve enjoyed so much about Whitby Town to keep you at the club for 4 years (and counting)? DW: I’ve enjoyed working with the players that I’ve had. What I think a lot of people forget is that these lads have jobs, they’re working day-in, day-out and then the club may train on a Tuesday night or a Thursday night, and we often have a midweek game. That might be away at King’s Lynn or Colwyn Bay. The players will finish work, jump on a bus, get there, compete for 90 minutes and sometimes won’t get back until 1 o’clock or 2 o’clock the next morning. Then most of them have to be up again for work a few hours later. I have massive respect for the lads at this level. They don’t get paid the fortunes that the Premier League players do, but they still show such commitment to the game. DB: Last season Town finished 13th and you’ve had a tough start to this season. Realistically, what are The Catch aiming to achieve in this campaign? DW: We’re hoping to achieve a play-off place. We’ve had a difficult start, losing six defenders in the first seven games! The team has had to be shuffled around a lot, because of that. We’ve also lost our regular goalkeeper [Shane Bland] so we’ve had to get a replacement in for him, as well. Despite all this disruption at the start of the season, we still have high hopes of a play-off spot. DB: You’re still only 38, so a young manager. Do you have a long-term plan for where you want to be in management in 5 or 10 years, or are you just focused on the here and now with Whitby? DW: I’m focusing on the present with Whitby, but obviously one day I want to be coaching in the Football League. I want to move up and progress. As a player I started at the bottom and worked my way up, which is how I see my managerial career going. Working at this level [Northern Premier League] is a great grounding. You learn to deal with awkward situations like players who can’t get off work or having to shuffle about a small squad. I want a gradual progression as a manager, and the learning curve here at Whitby will stand me in good stead for that. 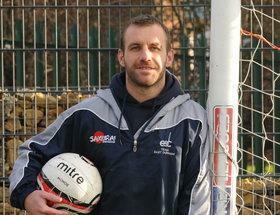 Darren coaches the footballing elite of the future at East Durham College. DB: Finally, what do you enjoy doing outside of football? And is there ever a career you considered aside from the beautiful game? DW: Outside of football, I enjoy time with my family. I coach quite a lot, and that’s an area I think I’ll stay in. It’s what I know. I coach with Evolution, and at East Durham College, and I’ll always enjoy the coaching side of the game! Posted on September 13, 2015, in Dave Burin Interviews and tagged Darren Williams, Dundee FC, Featured, Interviews, Northern Premier League, Sunderland, Whitby Town, York City. Bookmark the permalink. Leave a comment.